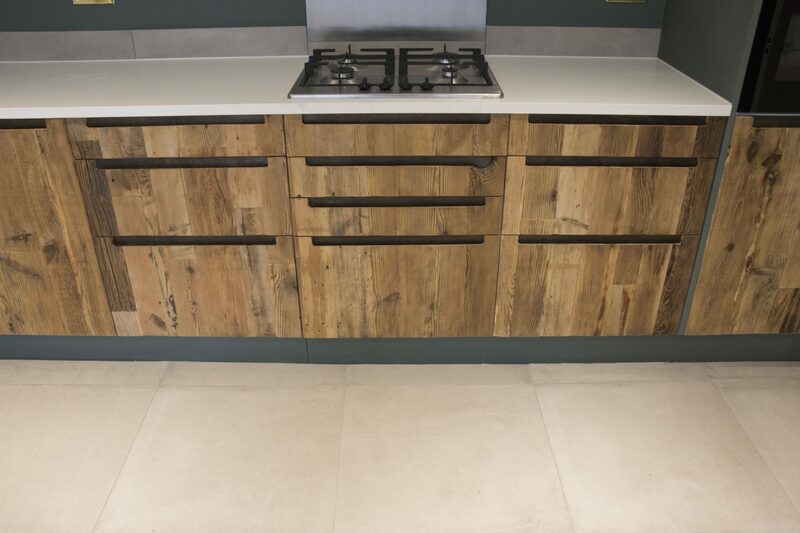 Brandler London kitchens are all bespoke creations. 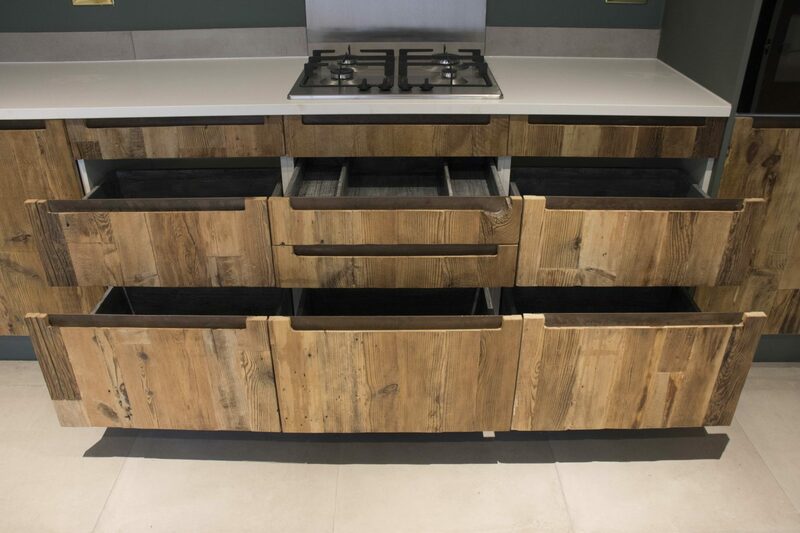 Every kitchen is a unique composition of our favoured raw materials, which are tailored to fit our clients’ finish and colour palettes. 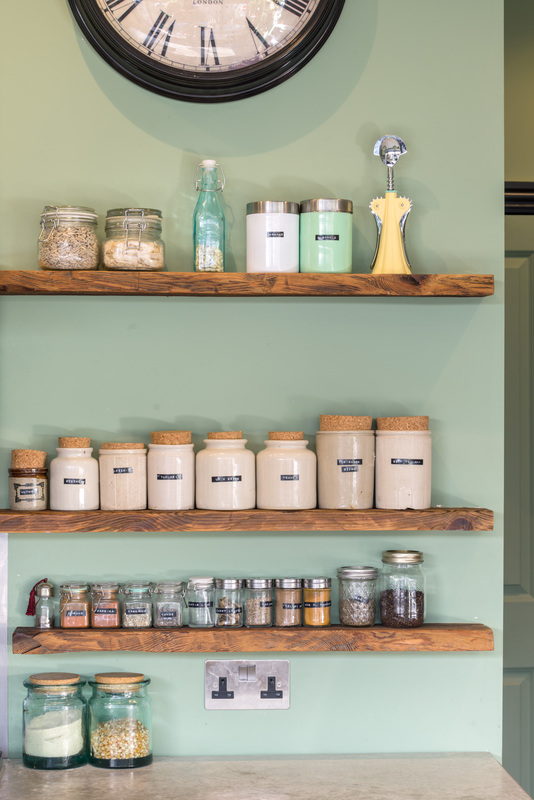 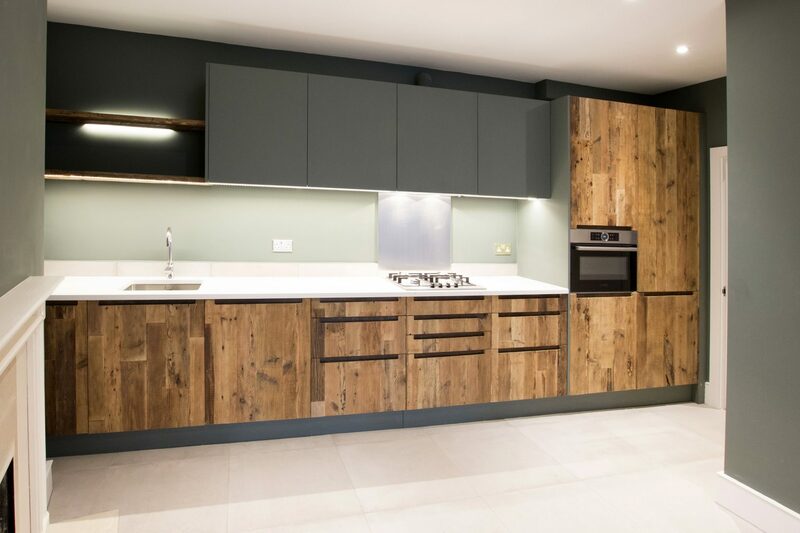 We pride ourselves on offering an extremely personalised service, making kitchens for a relatively small number of clients each year, ensuring the kitchens are all unique to their owners. 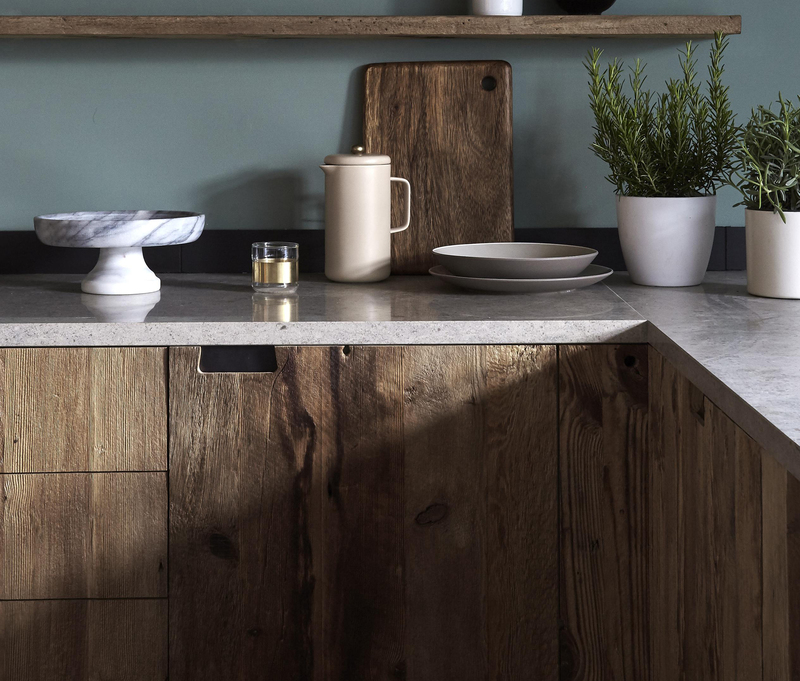 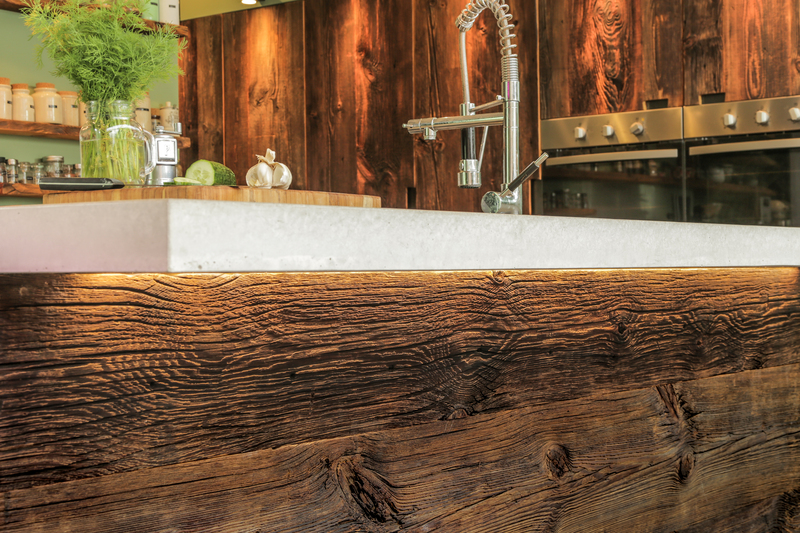 Additionally, each reclaimed board that we use will have its own grain, weathering, and depth of texture, giving you an individual kitchen finish. 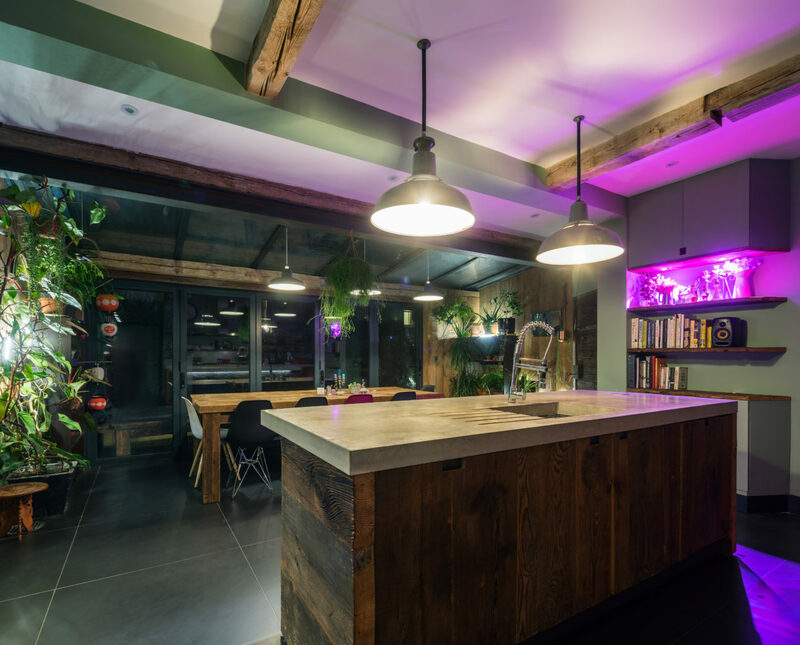 We offer a full kitchen design and build service, including retrofitted lighting designed to maximise the dramatic textural finishes. 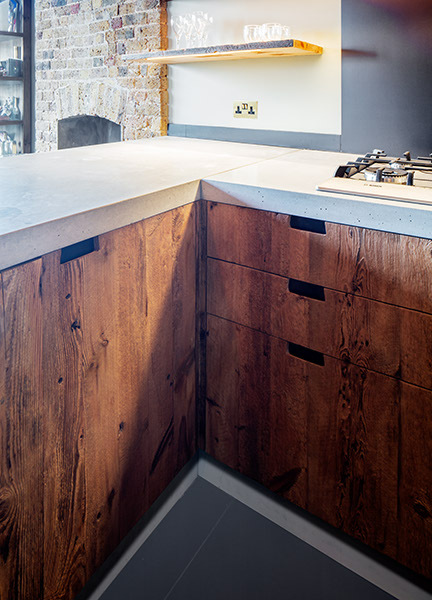 All installed to our exacting standards. 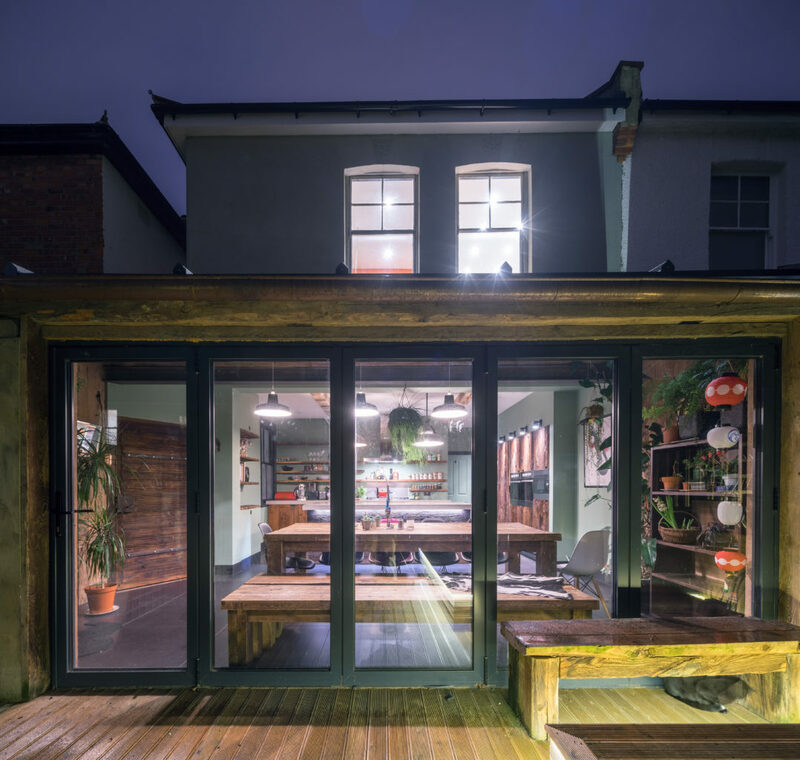 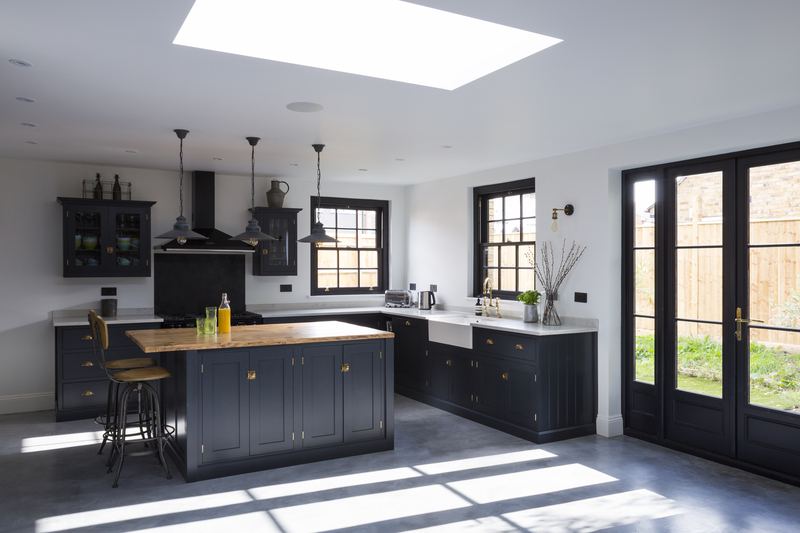 An Edwardian house refurbishment, this kitchen is formed of two existing rooms and extending into the garden with bi-fold doors and a glass roof. 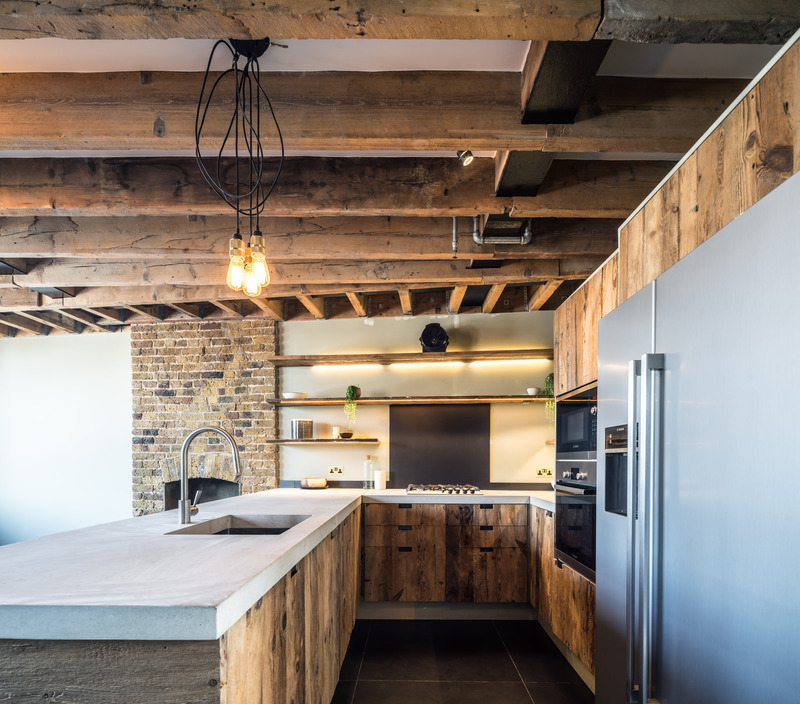 Reclaimed wood beams, exposed steels, and original Benjamin Electric pendant lights create a domestic, industrial feel. 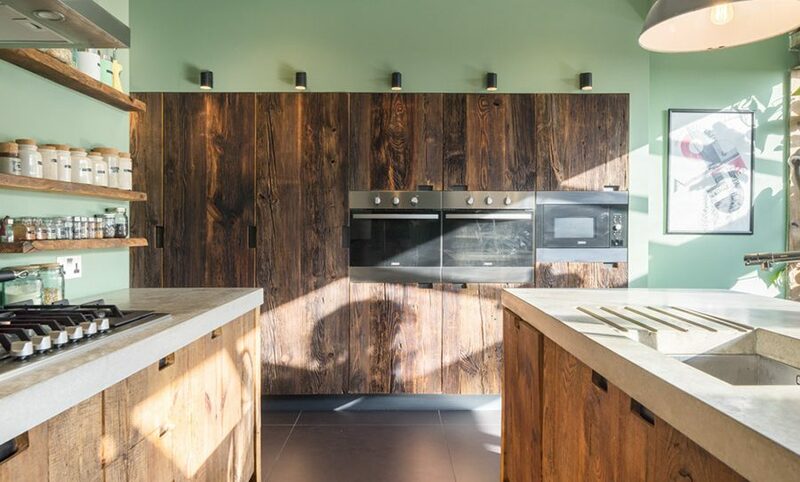 The raw, reclaimed barn wood used on the tall kitchen units and kitchen island are illuminated from above to highlight their deeply weathered surfaces. 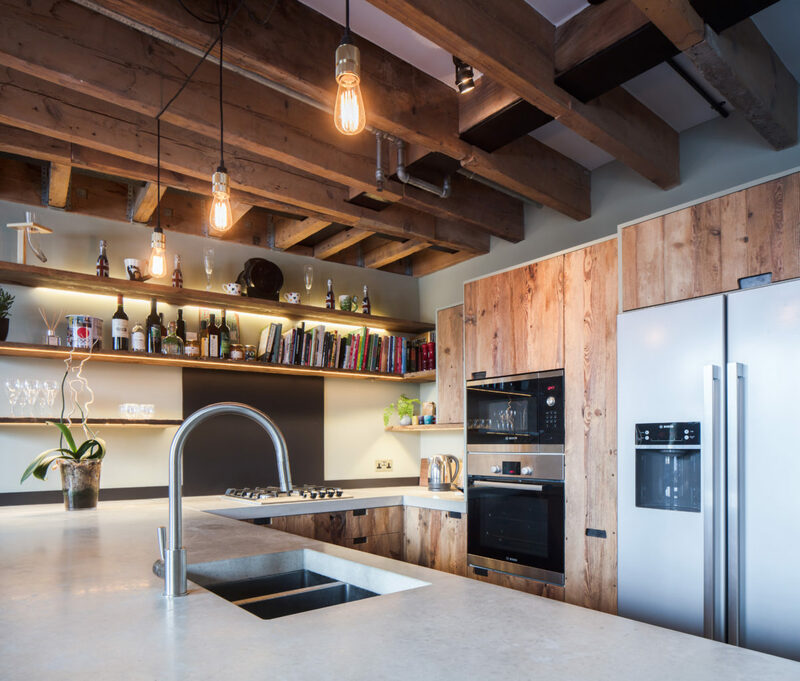 The open shelving spans the back kitchen wall, with concrete surfaces below. 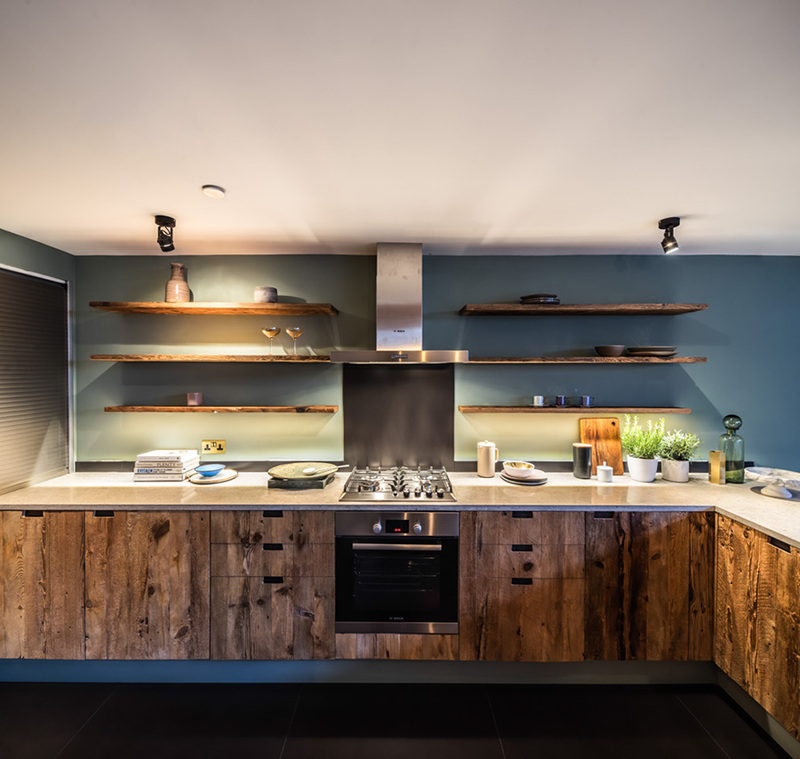 This kitchen is designed to be highly functional and unique to the owners who cook three meals a day at home. 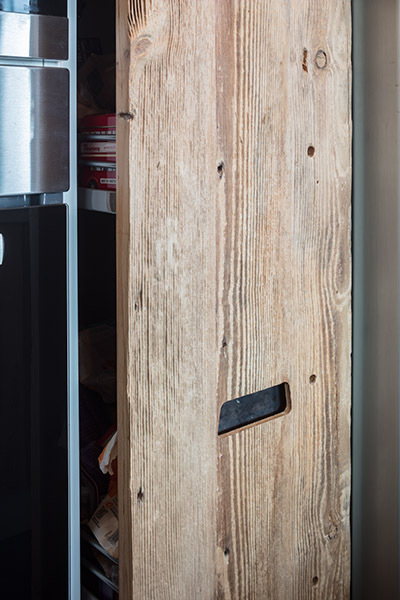 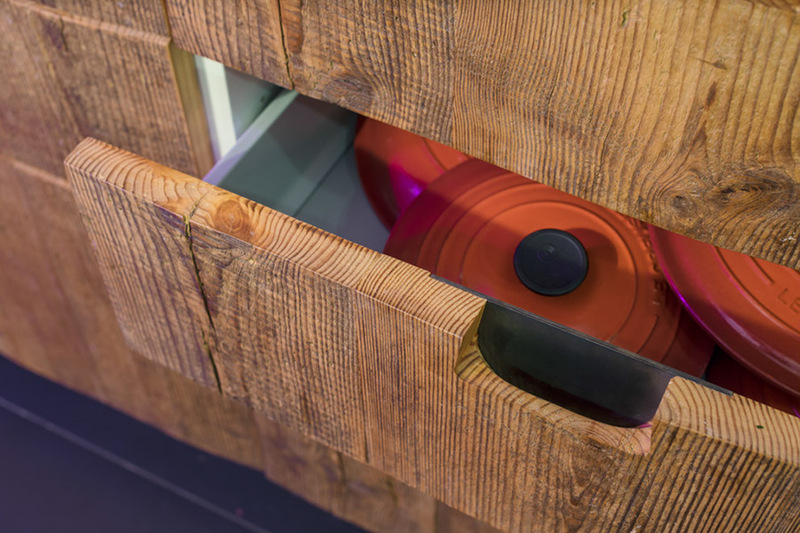 The handles are routed into the doors creating recessed pockets in the wood, backed with steel plate. 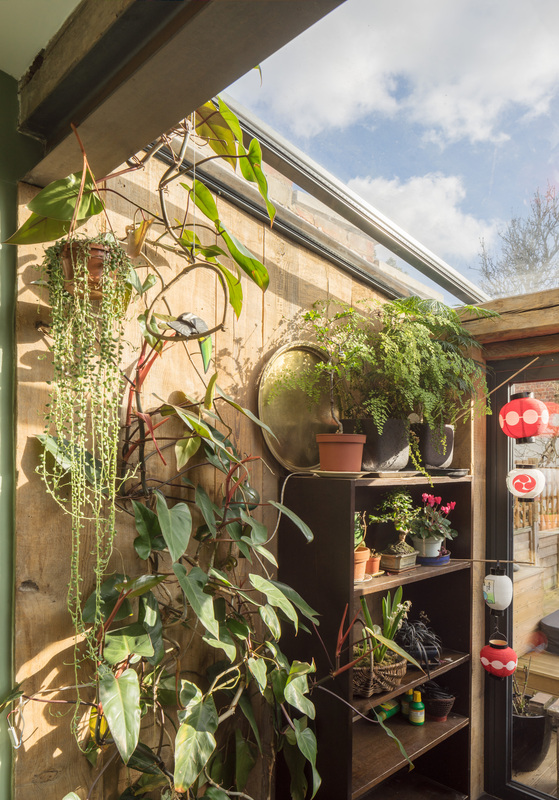 A built-in storage unit and reclaimed wood bookcase for the owners’ cookbooks was constructed with hydroponic lighting system to feed and nurture the clients’ herbs.The interior of the extension is clad with a light coloured, reclaimed pine, accessorised with plants with the aim to create a jungle canopy. 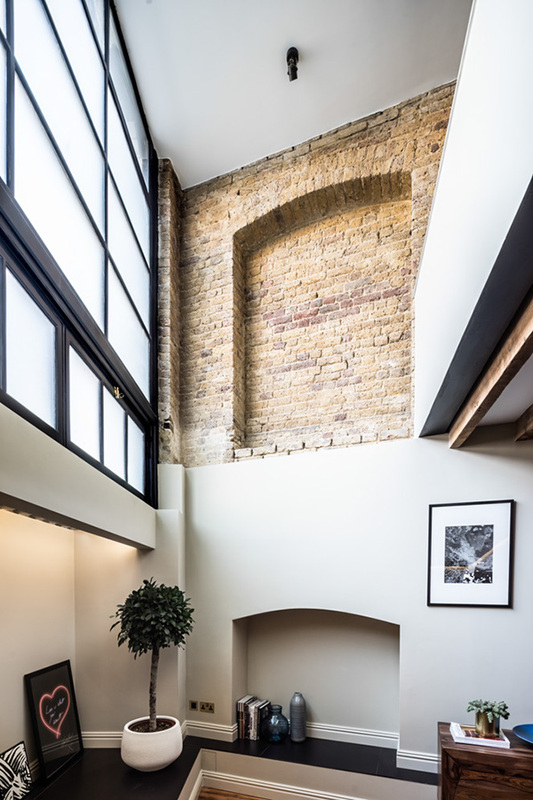 Now owned by Tom Daley, the penthouse unit in Brandler London warehouse conversion offers a glimpse into a property purchased by a British sporting icon. 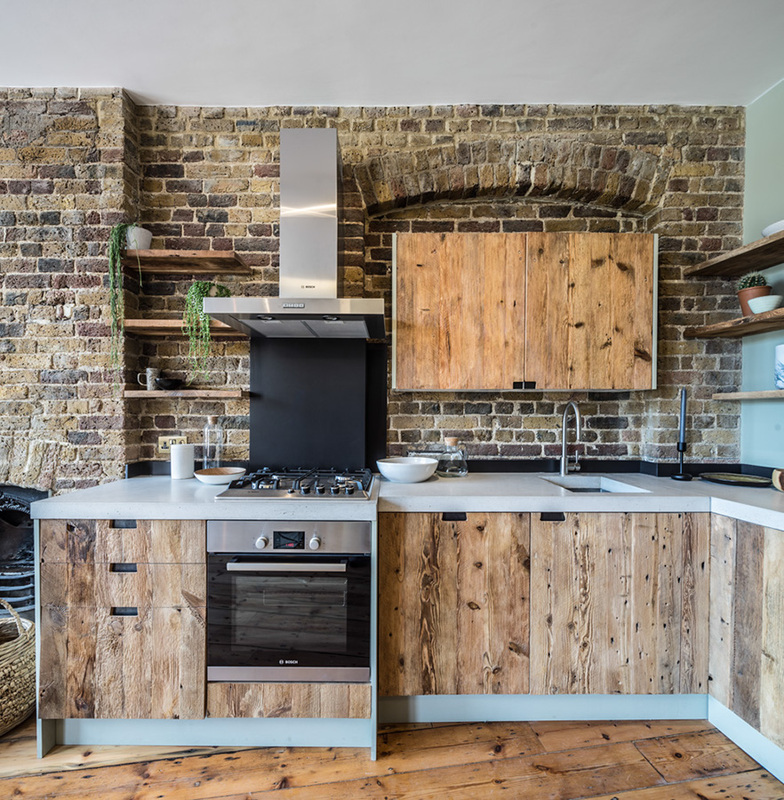 Reclaimed joists removed from the warehouse were given a new life and reinstalled as the bespoke kitchen doors, shelves and island. 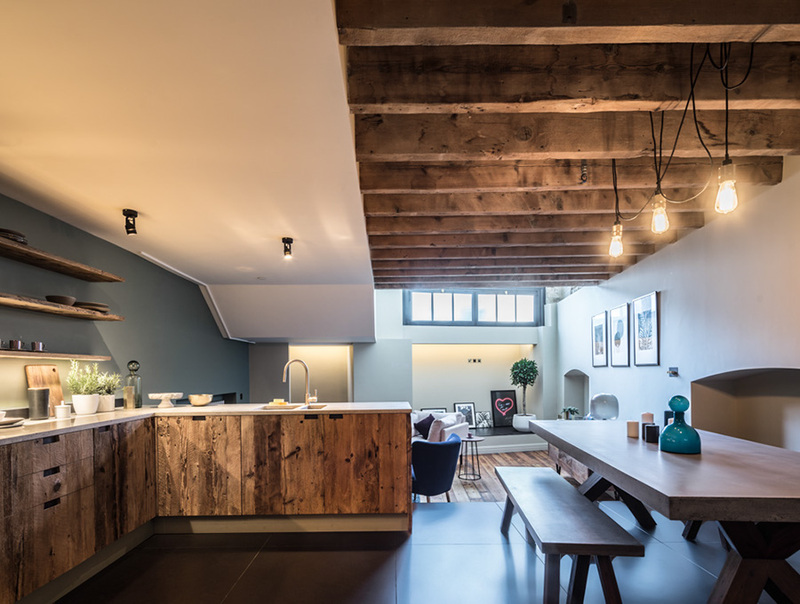 This kitchen and dining room of this three-level penthouse use the midlevel floor exclusively, creating the hub of the property. 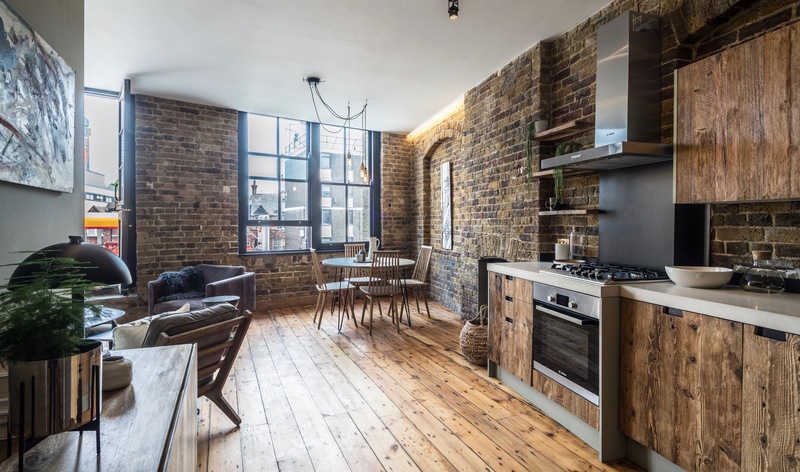 It is a space designed specifically for cooking, dining, entertaining, and relaxation. 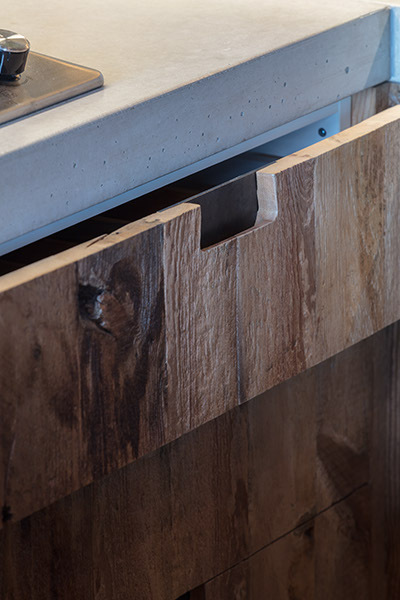 Concrete, metal, and wood come together in a stunning composition of orthogonal lines. 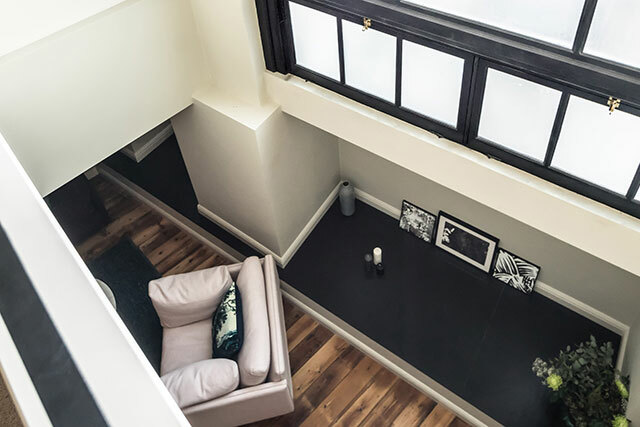 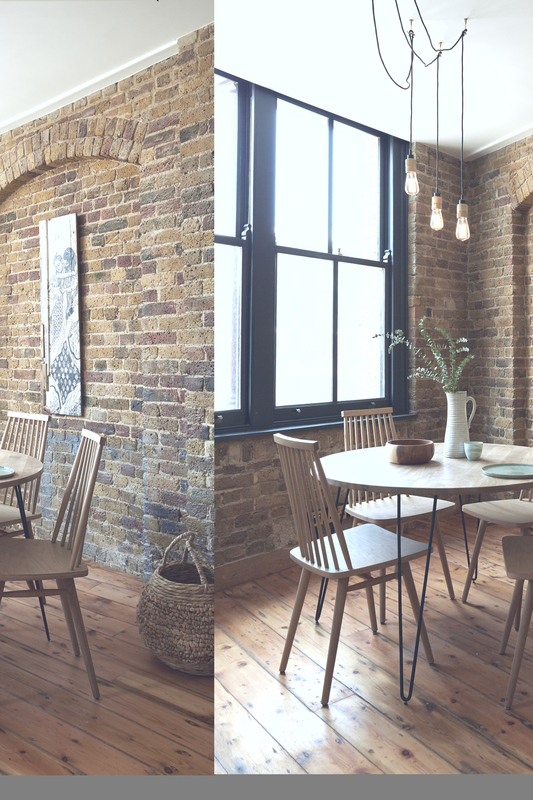 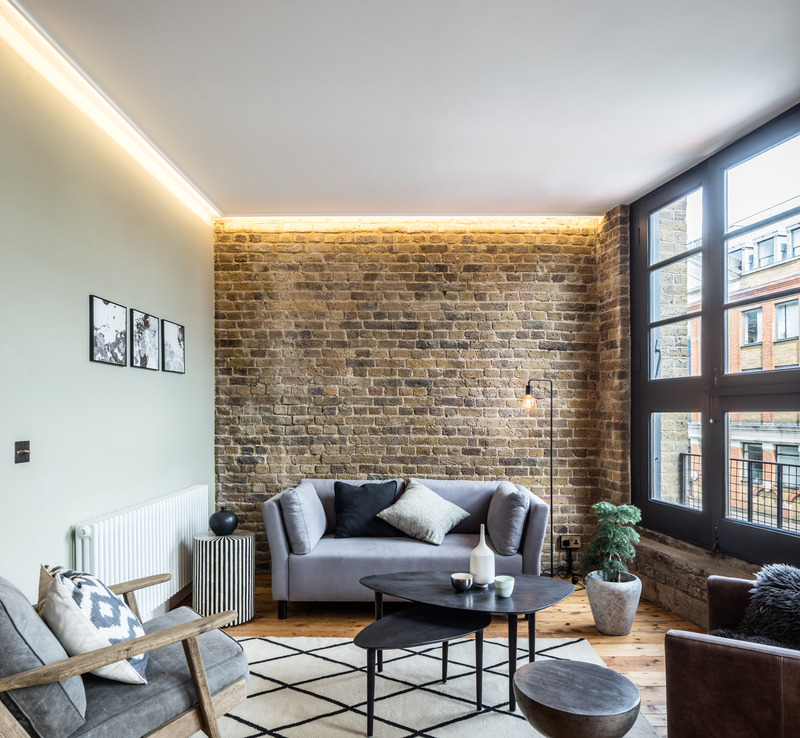 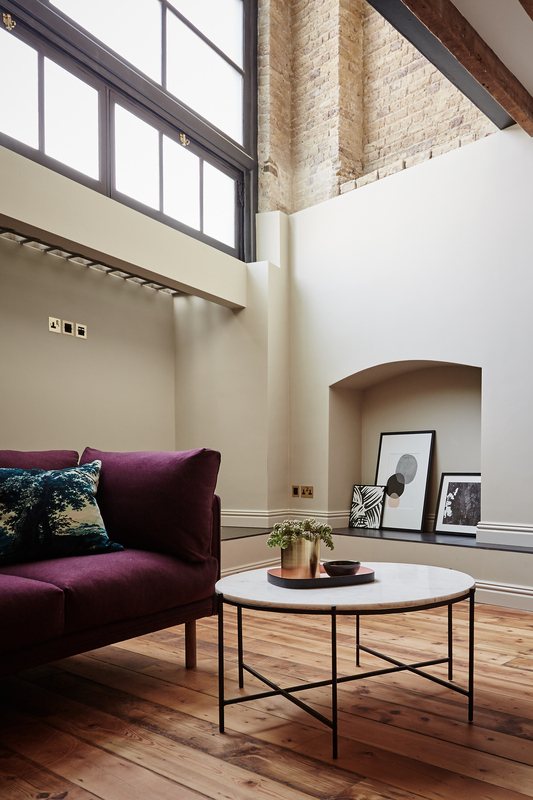 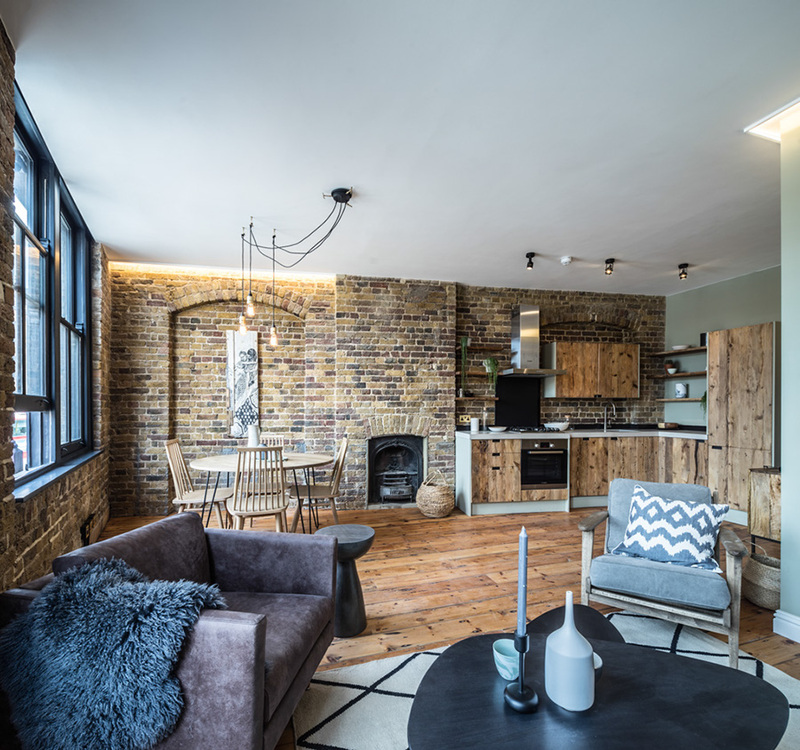 *Disclaimer – Property dressed by Brandler London for photography and as such expressly does not in any way reflect the interior design style of the owner. 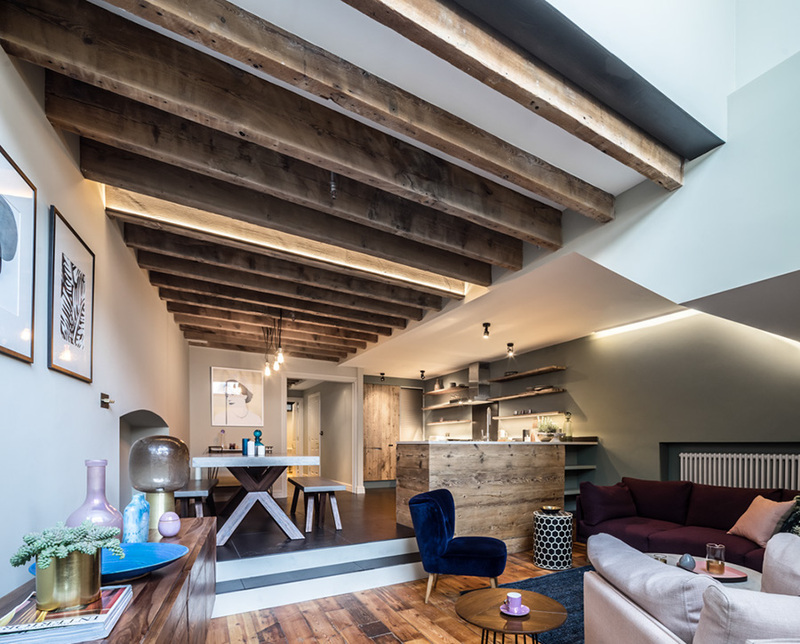 To bring this dark basement to life, we substantially raised the ceiling height and added a mezzanine. 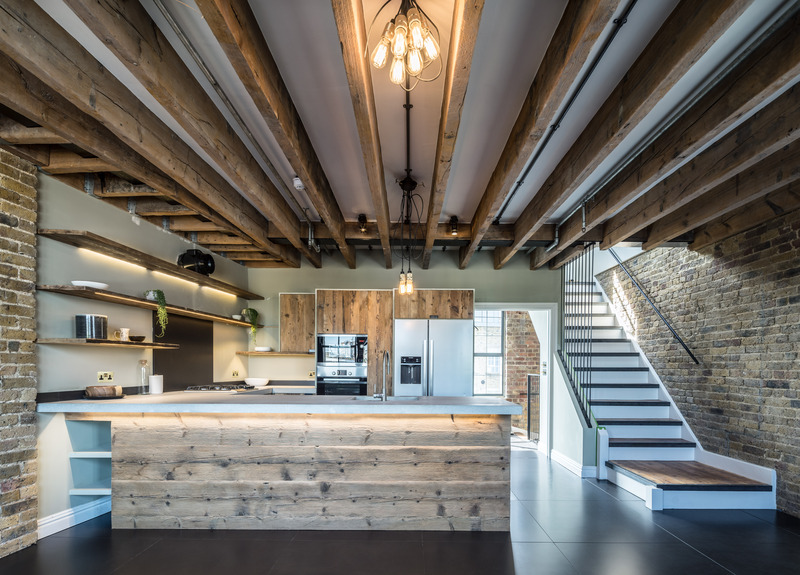 We used LED lighting on the shelves, alcoves, and beams to permit ambient mood lighting and illuminate every detail. 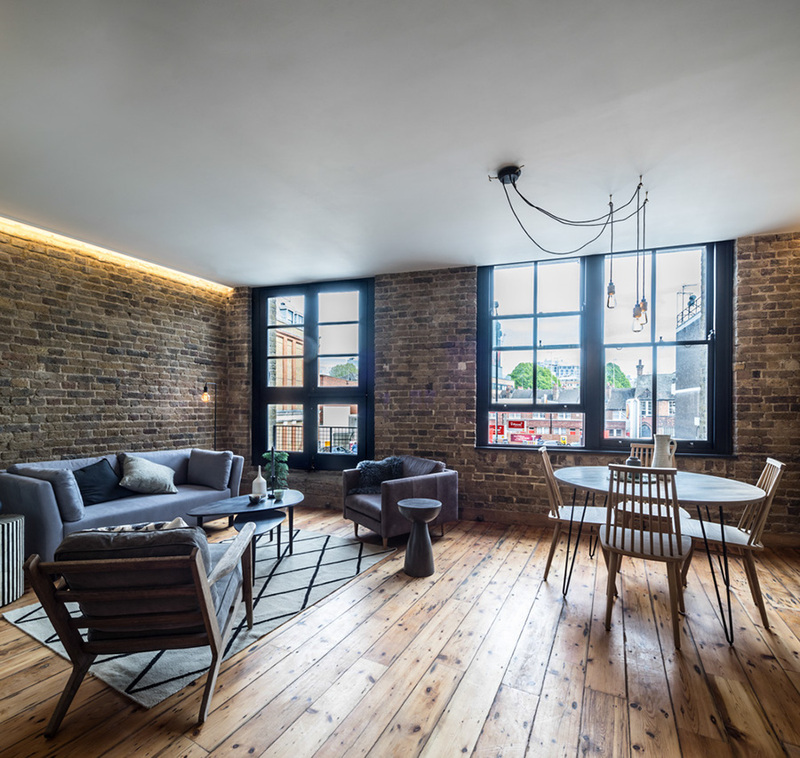 The movement of the open space design with altering levels from the kitchen to the living space and with the materials of wood, stone, and metal, all come together and give this room its own unique identity. 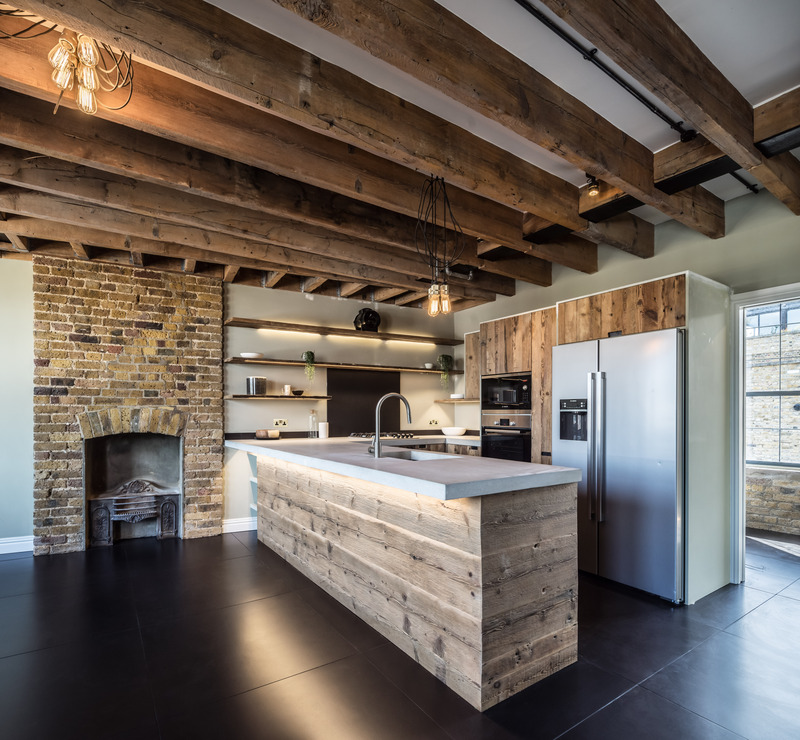 This warehouse conversion uses joists, reclaimed from the original building and given new life as the bespoke kitchen doors and shelves. 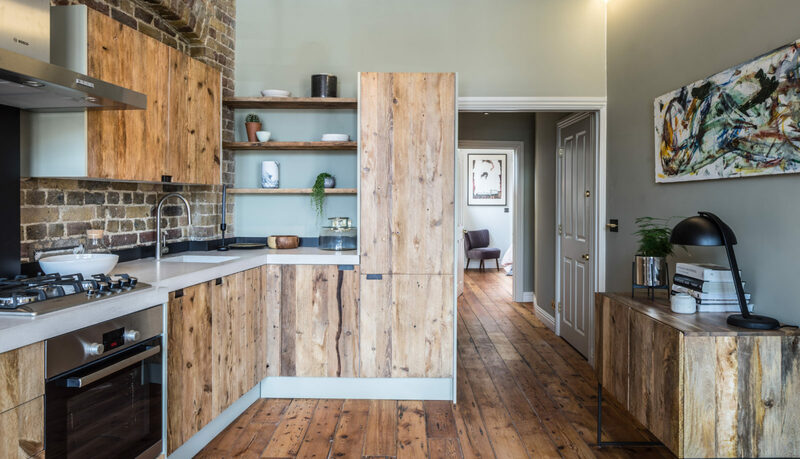 This open plan kitchen and living room with original floor boards, exposed brick, and reclaimed bespoke kitchen unites the activities of cooking, relaxing and living in this home. 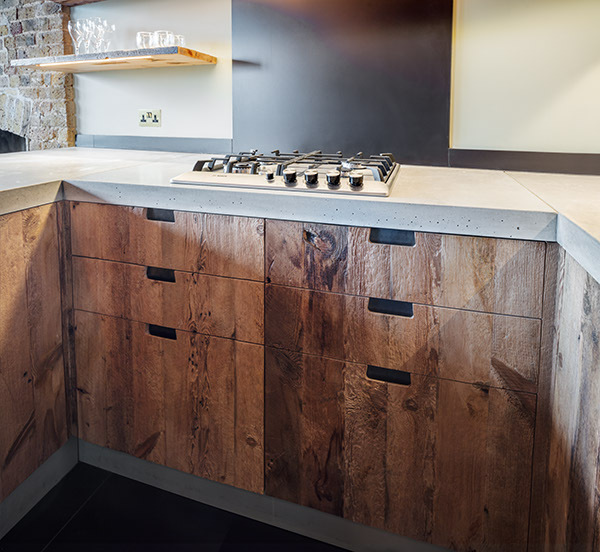 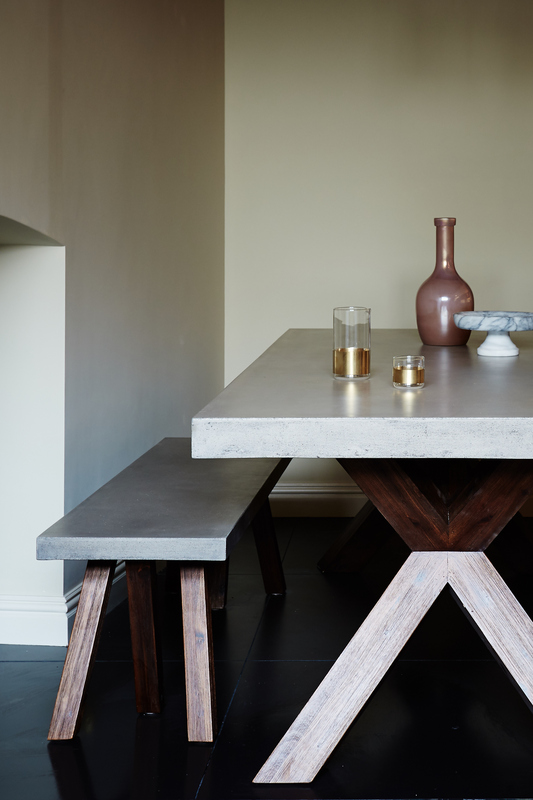 The kitchen optimises the Brandler London look of raw wood with the industrial aura of the home’s setting. 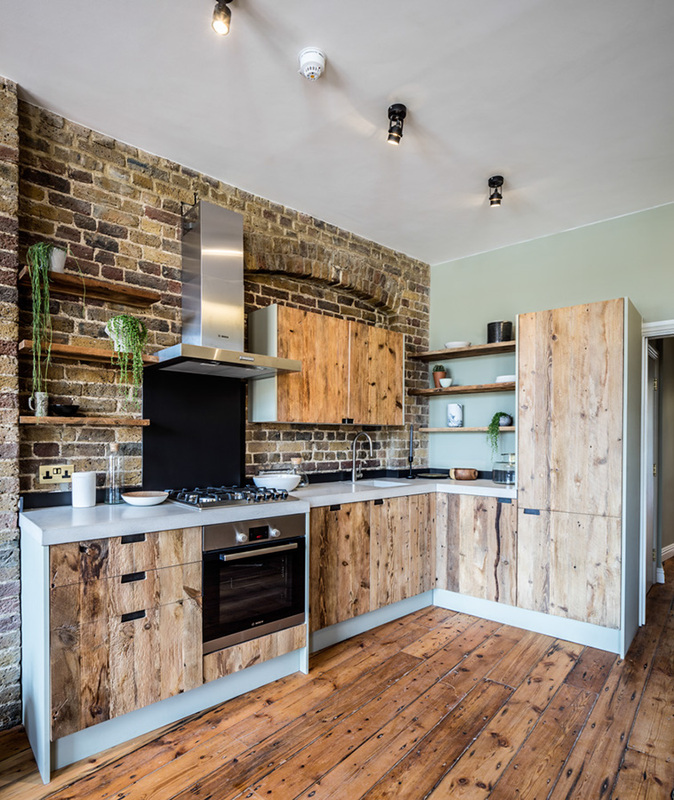 A Brandler London kitchen of one of our favourite repeat clients. 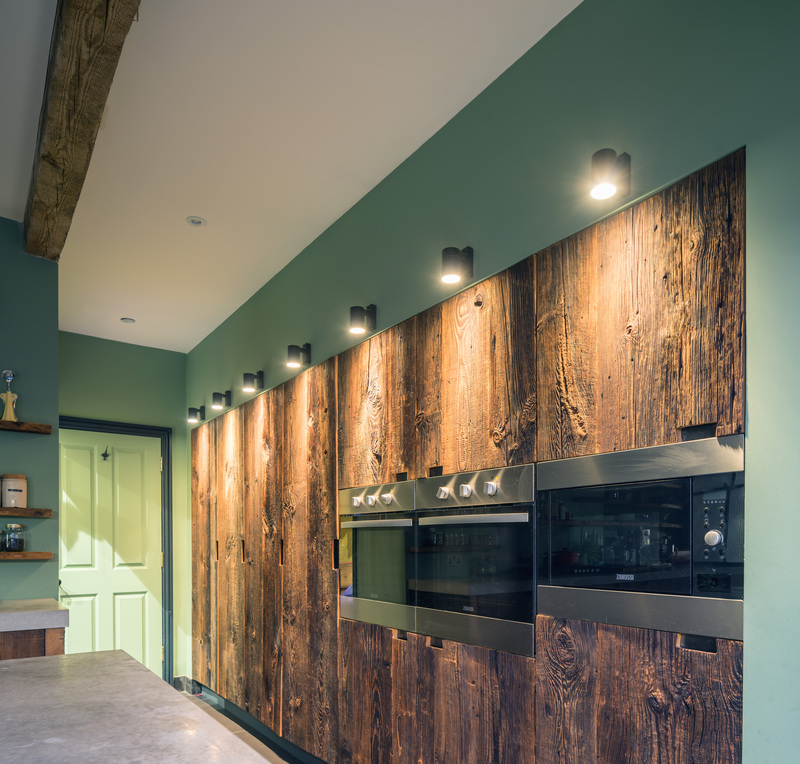 They opted for the a mixture of Raw and Native barn wood cladding which provides a satisfying composition of reclaimed wood. 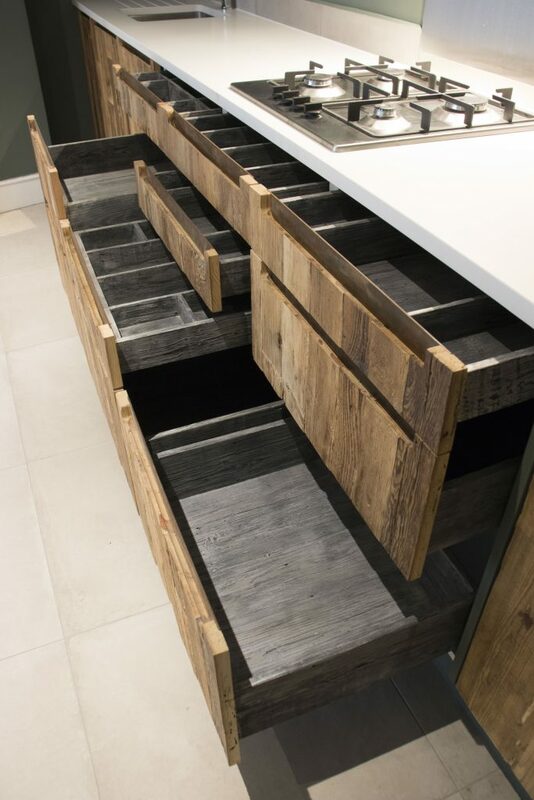 Our Cabinet makers spent a meticulous amount of time making the internal cabinetry. 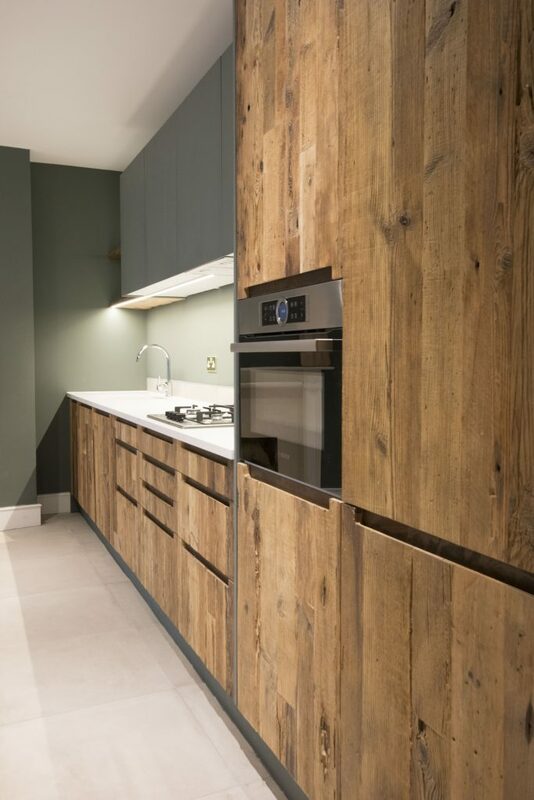 This was a long process starting with charring and sanding the wood cabinets, repeating this process followed oiling and sanding which is again repeat several times to get the desired affect. 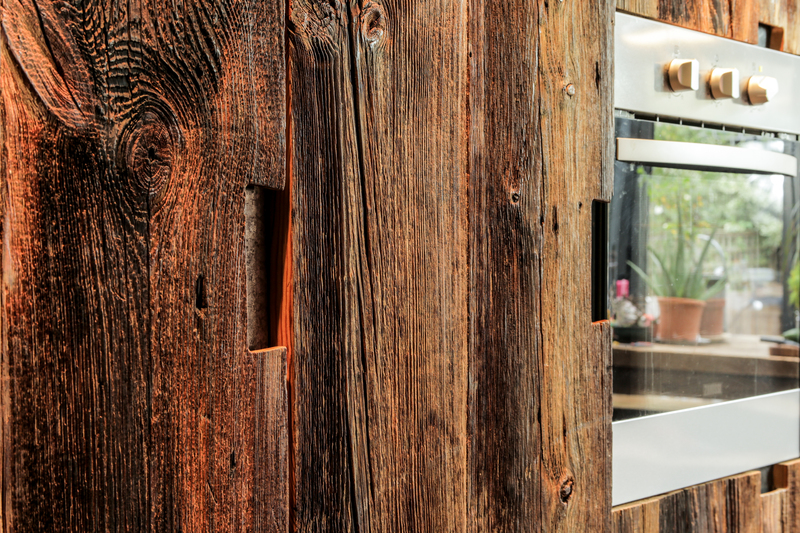 We applied a white hardwax oil to finish the cabinets and against the charred black wood have a beautiful affect in the grain of the wood. 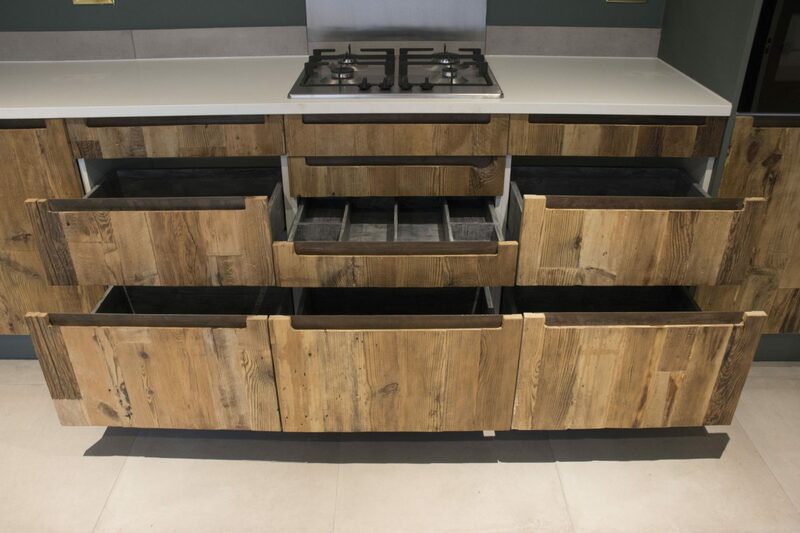 The handles we routed into the kitchen doors and kitchen drawer fronts, with acid etched and lacquered steel back plates. 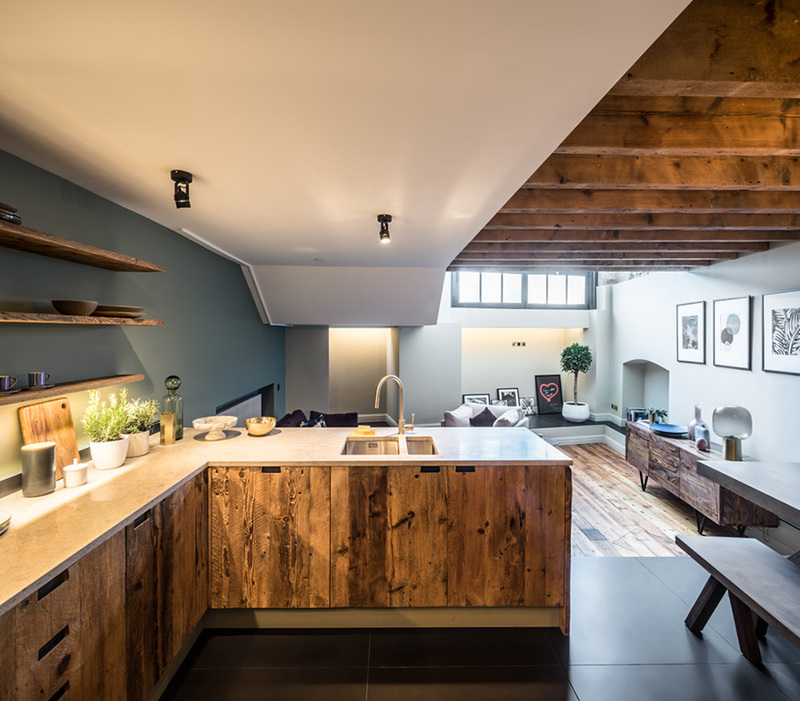 This creates and industrial kitchen in a contemporary design.